Suitable for all types of work, our industrial solutions permanently guarantee you Oxygen and Nitrogen in place. 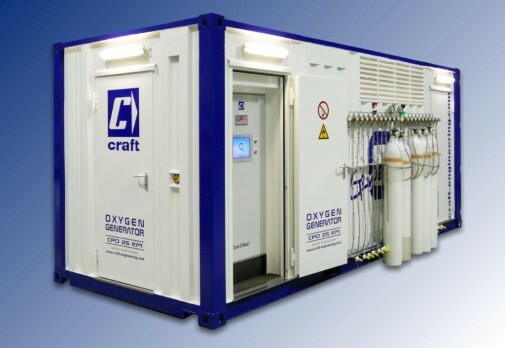 The particularity of Craft® is to integrate, right from the start, the oxygen production plant in a maritime container. Our machines are integrated into a container which serves as a technical room, with two access doors and a control panel. Having interior and exterior lighting, the container becomes an integral part of the production unit. Even though modified, it appears like a classic container, which allows it to be easily transported. By mounting on a classic trailer, the unit can travel quite simply, while ensuring the security of the apparatus. Generator of type PSA with molecular sieve, it is entirely made of stainless steel. 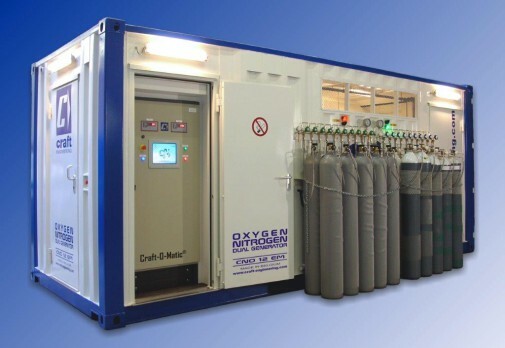 All the auxiliary equipment in contact with oxygen (tanks, valves, pipework, etc.) are also in stainless steel. The regulation by an automatic control system with pneumatic commands allows millions of cycles to be performed. At the outlet of the generator, the dewpoint can go down to -75°C. Servicing required every 2,000 hours, slightly dirtier, its electrical consumption is greater but the purchase price is lower. 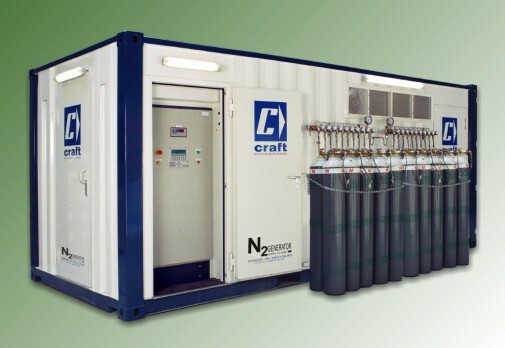 Craft® units separate nitrogen from the air, using a molecular sieve (activated charcoal type). Faithful to its policies, Craft® puts efficiency and durability to the fore in its units. This is why they are integrated into a modified shipping container serving as a technical room, with two access doors and a control panel with digital screen. The container is equipped with interior and exterior lighting. By its particularity, the container represents and excellent shelter against dust, rain intrusions and especially against theft. It allows the CPN units to be operational with all doors closed. A ventilation system has been designed to guarantee the efficiency of the machines irrespective of temperature and humidity. Like all the ISO containers, the unit is easily transportable. In addition, by mounting it on a classic trailer, the container then has exceptional mobility. Generator of type PSA with molecular sieve, it is entirely made of stainless steel. All the auxiliary equipment in contact with nitrogen (tanks, valves, pipework, etc.) are also in stainless steel. The regulation by an automatic control system with pneumatic commands allows millions of cycles to be performed. At the outlet of the generator, the dewpoint can go down to -75°C. By integrating our machines, we supply protection against intrusions of dust, rail and theft. The CNO can operate therefore with all doors closed, and outside because of its system of ventilation, designed so as not to be dependent on air conditioning. Its exterior, always being similar to any other shipping container, it is easily transported. Placed on a classic trailer, the unit can be easily moved over large distances. Generator of type PSA with molecular sieve, it is entirely made of stainless steel. All the auxiliary equipment in contact with oxygen and nitrogen (tanks, valves, pipework, etc.) are also in stainless steel. The regulation by an automatic control system with pneumatic commands allows millions of cycles to be performed. At the outlet of the generator, the dewpoint can go down to -75°C. What solution to user? Let us help you.